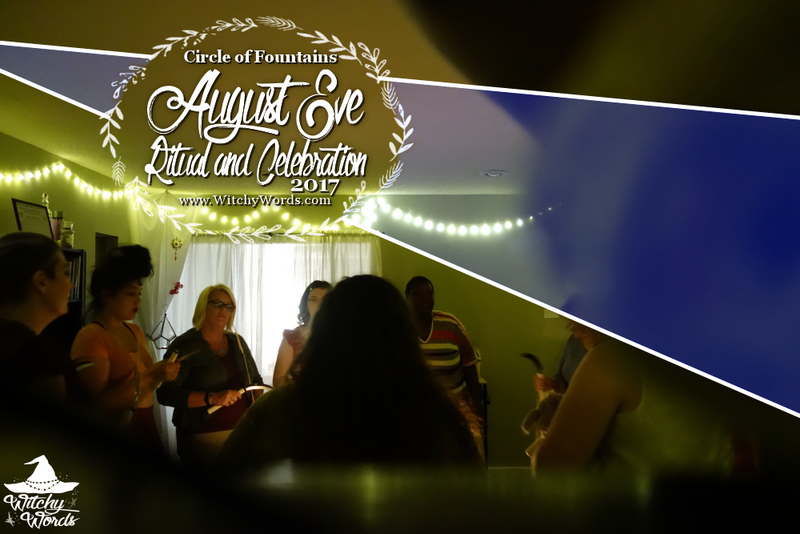 This post will cover the August Eve / Lammas ritual and celebration held by the Circle of Fountains. To see the Circle of Fountains 2016 August Eve ritual, click here! This year's equinox ritual was held by Tamilia! Tamilia is a devotional polytheistic witch with strong background in trance, spirit communication and psychotransformation. More about her practices can be found on her blog, Wandering Woman Wondering. As always, the purpose of Circle of Fountains is to bring together a diverse perspective on what it means to be a witch. The sabbats give us an opportunity to sample each member's craft, expanding our horizons and our own practices. As with most CF rituals, August Eve began with a potluck feast consisting of a variety of foods including corned beef, potatoes, chicken, rosemary cookies and more. Also on the menu was an apple wine that was absolutely delicious! After the feast, we started on a mason jar craft! The craft asked us to focus on questions such as "What crops are still growing in your life and require active cultivation?" and "What must you release in order to bring in your crops?" We were asked to write these on cards provided to us by Tamilia. These cards were sealed as scrolls with twine and placed inside the jar. We then created a sachet to add to the jar with various herbs, stones and a golden sickle charm. Finally, we chose charms that represented our goals and sealed our jars shut. In addition, Tamilia gave each of us our own personal sickles. We charged our sickles, empowering them with what we wrote on our scrolls for the jars. We were then cleansed with water and smoke and asked to enter the ritual room. In the ritual area, an altar was adorned with candles, bread and wheat along with a gorgeous large-scale sickle. After circling the altar, Tamilia along with other participants called upon each element, blessing pieces of bread in the process. We then honored the bread and ate it. A stalk for each labor of love"
What is your name? This would be a word of power, something that identifies you wholly. What is your sickle's name? This is what you give, what you have to offer to others. What is the name of the chaff? This is what you release, what you no longer want. You would cut the wheat with your sickle as everyone chanted "Chop, chop, chop!" Rising and falling and rising again." The wheat has fallen only to rise again. And thus, the mystery of the grain: What falls rises again, transformed by the elements into bread. The bread and ale were then passed around the circle. And with that, the rite was complete and the circle was closed! From my circle to yours, I hope you had a blessed August Eve! Love the sickles! Where did you find them?